Sorry I haven’t written in a while; I was plannig to blog over the weekend, but my wi-fi wasn’t working, I had lots on, blahblahblah. Anyway, here I am with functioning internet in the school library (in one of my free periods, don’t worry, I’m not skipping lessons!) 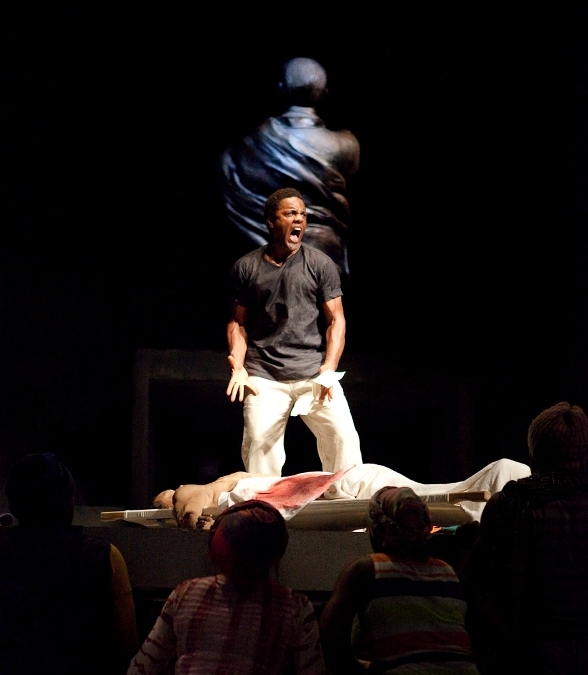 and I can finally write about the African ‘Julius Caesar’ directed by Greg Doran that I saw about a fortnight ago. I know I’ve written a lot about this production in this blog, as there have been countless articles, reviews and interviews about it, as well as a television-film production on BBC 1 earlier this year (which I have taped but decided to leave until after I saw the actual production, rather than spoil it for myself). I saw a different RSC version of ‘Julius Caesar’ last year at the Roundhouse, so it was interesting to compare the two. You are thrown into the world of Rome, Africa from the moment you reach your seat at the Noel Coward Theatre; the ground is dusty; the heat is heavy; the drums and afrobeat music are rhythmic. There are actors dancing and moving to the music on stage so that you are truly thrown into the world you will be spending the next 2 and a half hours in. This is actually vital, as there are none of the usual “switch off your mobiles” and “5 mintues until curtain up” announcements. Instead, the theatre suddenly goes pitch black and the action begins. I have to admit that I didn’t toally understand the first few lines that were said, as my ears took a second to adjust to the lilting African dialect. However, after that the accent in fact made the lines sounds more realistic. 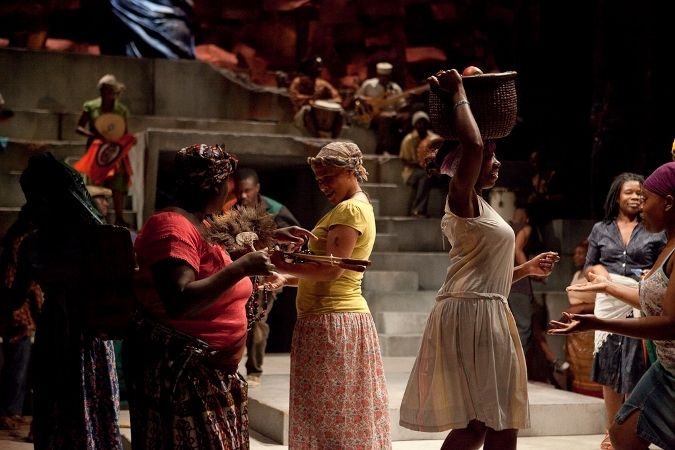 The African setting was totally believable and made the play more relevant; in the production dir. Lucy Bailey in 2011, the play was filled with gore and violence throughout, which worked just as well at making the production engaging, but this version was probably a little more credible. 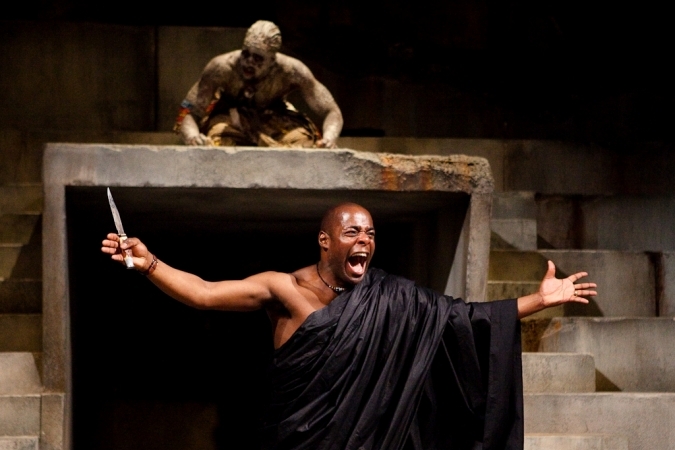 Paterson Joseph was excellent as Marcus Brutus; you could see why he made the decisions he did as he reasoned it out and yet you were horrified at his smug self-regard and the madness that seemed to creep up on him as soon as he was propositioned by Cassius. Cassius (Cyril Nri) was also very well acted as someone who really did fear the worst if Julius Caesar was able to become King. In Bailey’s production, Cassius was a little more sinister, who seemed more concerned with his own ambition than with the good of a society. Nri’s choice in playing him meant that it seemed more realistic that Brutus would choose to accept his offer and regard him as such a close friend. One of my favourite actors has to be Ray Fearon as Mark Antony. The review that described him as “a raging bull” was certainly accurate. He storms across the stage, clearly using the full power of his rhetoric to whip the crowd into rebellion and yet he does seem genuinely distraught at Caesar’s death. A small part I also loved was Lucius, Brutus’ servant (Simon Manyonda). Although he had barely any lines, he made the most of his part, gaining lots of laughs and also showing his emotion at having to help his master to commit suicide. The staging was excellent; there were no scene changes at all, yet the set managed to become a senate, a stadium, a house, an alleyway, a tent, with very few props brought on. There was the typical ‘dictator’ statue at the back which fell dramatically when the Caesar appeared as a ghost to Brutus. The lighting also added a lot to the performance; it wasn’t too over the top, but gloomy and stormy enough to be chilling on the night that the Cassius finds all of the conspirators. The soothsayer was almost constantly on stage during the first act perched on top of the entrance and exit int he middle of the stage. Although he worked well as a witch doctor, I wasn’t sure about his constant prescence; I didn’t feel he added anything by being there, but then again, he didn’t detract fr om the experience, so no harm done. The only criticism I have really is that the ending seemed to come about much too abruptly. Of course, this is partly because of the way Shakespeare wrote it; one moment Cassius has killed himself mistakenly, yet Brutus’ armies are winning and the next it has all gone wrong and Octavius Caesar and Mark Antony are victorious. Most of my friends also mentioned this; Cassius died, Brutus died, there were a couple of lines more and then it was all over. I don’t know the play well enough to know whether parts were cut out or not, but if so I think it could have been slightly better had they been left in. ‘Julius Caesar’ isn’t a play that well known for its female parts, and I felt this production didn’t really change my opinion on this. Although Portia and Calphurnia were well acted, at times they came across merely as hysterical women, which I suppose is exactly the mistake that Caesar and Brutus make, but I felt that, even though one knew what was going to happen, you still doubted their word and wrote them off as mad. Saying this, overall it was a great piece of theatre and it was interesting to see how Shakespeare can work just as well in a foreign setting; a point already proven by the ‘Much Ado About Nothing’ set in India that I’ve already mentioned and which, coincidentally, is coming to the Noel Coward Theatre next. One small thing to the costume department though; the black togas worn in the killing of Caesar scene (I can’t use the word ‘assassination’ as it hadn’t been invented then – Shakespeare used it for the first time in ‘Macbeth’) looked frustrating for the actors to wear; they were constantly coming undone and falling off. In addition, call me bloodthirsty, but I would have preferred a little more blood in that scene. There was none at all until the conspirators dipped their hands in it, which is pretty gory in itself, but I feel it might have made more of an impact had there been a little bit more corn syrup splashed around!